This awesome worship album features 25 of the most popular songs sung in Australian churches. Includes such favourites as 'I Can Only Imagine,' 'Be Still For The Presence,' 'God of Wonders,' 'Majesty' and many more. 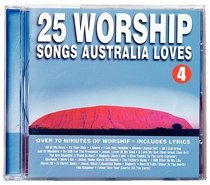 About "25 Worship Songs Australia Loves (Vol 4)"